Arab Computers, Arab Business Machine‘s distributor, has announced that Apple’s iPad 2 will be available in Saudi Arabia “at the end of next week”, the first week of May. It is very strange that Saudi Arabia was not included in Apple’s press release announcing that announced the iPad 2 in UAE and several other countries. Apple continues to ignore Saudi Arabia and treats the UAE as if itâ€™s the only country in the Middle East. According to my sources in Saudi’s communications authority, CITC, they never contacted Apple and asked them to remove FaceTime or censor the Apple App Store. I believe that the UAE’s communications authority, TRA, is the one that asked Apple to remove them and for some reason they applied it on Saudi Arabiaâ€™s devices and app store. We tried to contact the TRA and we got no response. I also worry that due to the lack of FaceTime, gray market vendors will hike their imported iPad 2 prices. 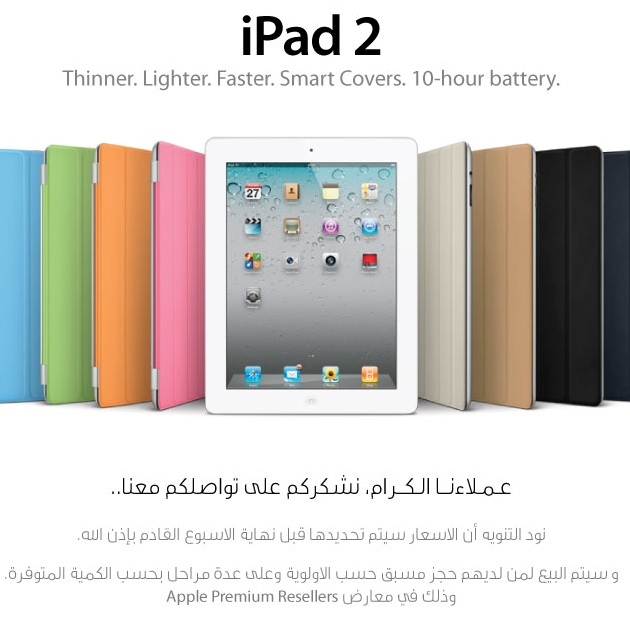 Previous: iPad 2 in UAE, Turkey, Others this Friday. Where’s Saudi? After talking to said person, he told me that they don’t have a pre-order system & everything is based on a first come-first serve basis ; and that the most he can do at the moment is write down my number & inform when it’s available. 2weeks ago, i finally receive the long awaited phone call while being in madrid, spain. he informed that they got the iPad 2 in stock [Wi-Fi Version Only] for the launch price of 3000sr. After returning from trip to spain i decided to check it out for myself, turns out they DO REALLY HAVE the iPad 2. Is Jarir dabbling in the gray market ? I THINK SO. I agree, the prices of iPad2 would be different or even higher in the gray market and yes thats due to the facetime issue plus the fact that big boss cant get the quantity which fits the demand here anyway! In which case our usual demand and supply would prevail. Most importantly, the best part is that even in the secondary market; for sure, there would be ceiling on prices on iPad2. Can anyone get a white iphone4??? I am willing to pay a premium on that, arent you? It’s no different than my BLACK iPhone 4. Why would i ? I’m so excited to tell you that we carry all of APPLE products in ourÂ comingÂ very soon website. However, we are accepting orders right now and Alhumdulleala we have sold more than 500 items from ipad2, ipad1, iphone 4 and all of the apple store. Â KEEP in mind that our price with NO Kidding is one of the best price iphone 4 now is for 3888 SAR and of courseÂ face timeÂ in there. so check us out from time to time. 3888 for 32gb iPhone 4 ? When are you officially launching your websiteÂ http://saletab.com. I need iPad2 (Wifi only) 64GB since I can hotspot my iPhone4 to it. Facetime is essential for me. Secondly, yes it would be priced with a premium. If you realy want one, order and wait for it. BS about its too thick and my cover wont fit??? Anyone who really wants one will get one, no matter the price or thickness, but functionality is the same. Plus, there r no such better prices as 3888??? What r we in china?? Thanks Mohammed for your comments. prices are there but im not sure what to do ??? do we go to their branch and pay or what exactly ??? FaceTime is really good , why they removed it ? is there any difference between who lives in Saudi Arabia and who lives in uae?